Picture editing becomes a much more enjoyable process if you’ve got a photo editor with advanced tools that is easy to use nonetheless. 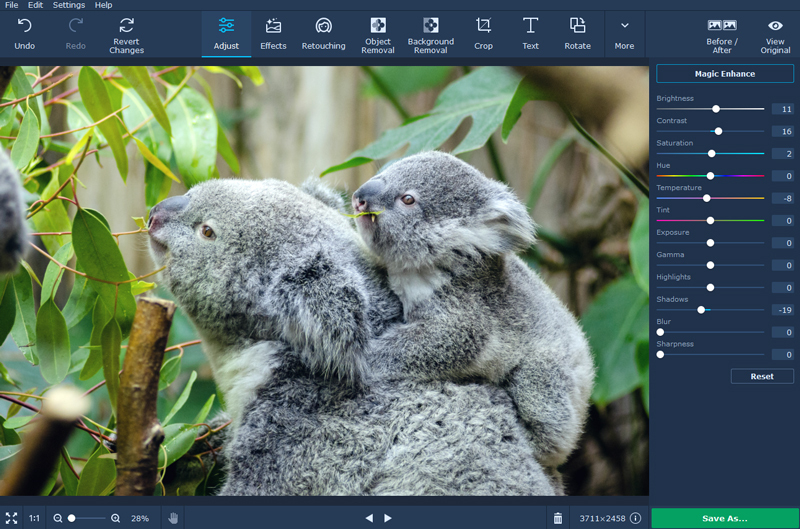 The latest version of Movavi Photo Editor definitely ticks all the boxes and here are the reasons why. First of all, now you have more ways to transform your photographs. Second, new animated hints make it easier to figure out how the instruments should be used. And third, its main features just keep on being improved with each update, making the interface even more user-friendly. The handy sliders will help you tweak manually the following parameters: brightness, contrast, saturation, hue, tint, temperature, gamma, exposure, highlights, shadows, blur, and sharpness. The ‘Magic Enhance’ button will modify your image just in one click finding the optimal combination of brightness and contrast. This tab is a real gift for those who like taking portrait shots. There are a lot of instruments that you can use to fix most of the possible imperfections or to completely change your appearance. Basically, these tools can be divided into two big groups: retouch and make-up. 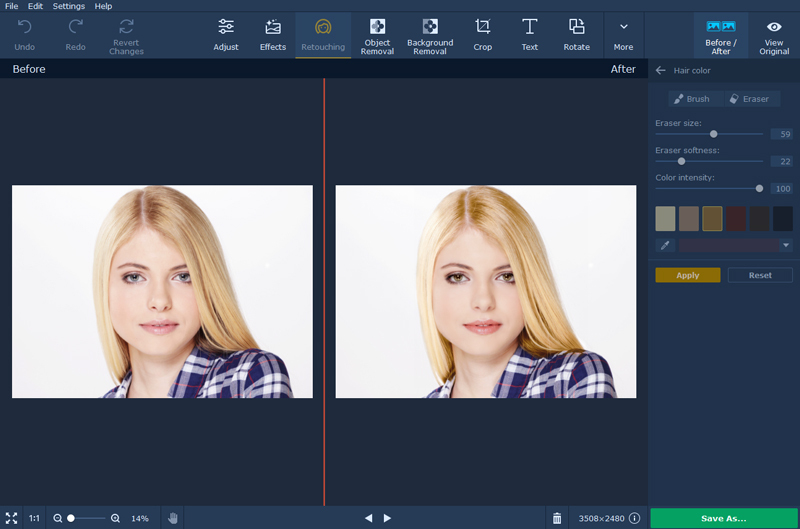 Touch up your pictures just a bit or go for a complete makeover. Either way, your selfies will look perfect from now on. At any point of editing, you can compare the original image with the enhanced one by choosing the ‘Before / After’ option. Picture editing software won’t be complete without a great collection of effects. 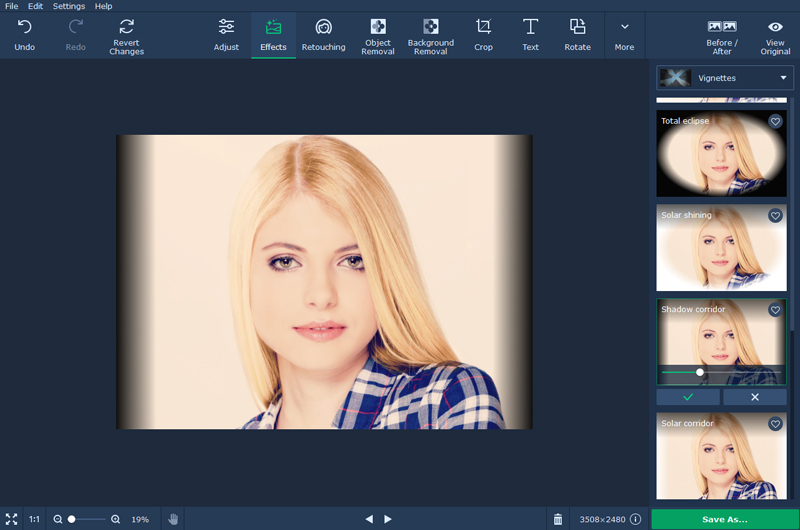 Movavi Photo Editor gives you a choice of more than 100 thematically grouped color filters, textures, and effects. Plus, you can ‘like’ the ones you prefer and quickly find them in ‘Favourites’. One more advantage – you can add an unlimited number of effects and adjust the intensity of each layer. With the help of these two tools, you can easily get rid of everything that spoils the picture – a random person, an odd object or even an unpleasant background. Another way to make use of background and object removal is to create an impressive photo montage replacing boring surroundings with an unusual backdrop. You can also change the background to a solid color and make a collage pasting more photos. Following the animated tips, you’ll quickly get the hang of the instruments. 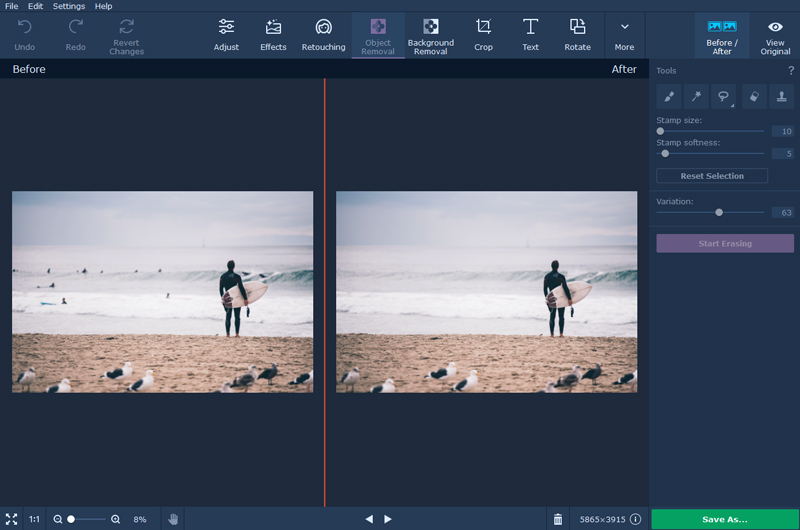 In brief, Movavi Photo Editor’s multifunctionality doesn’t affect its simplicity in any way. 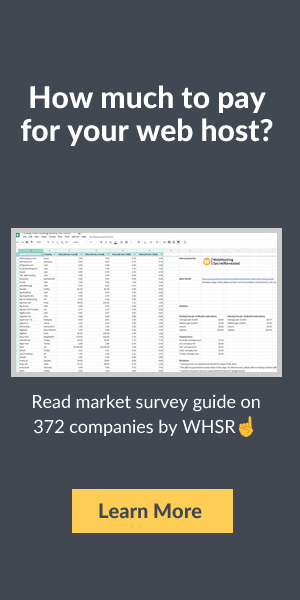 Navigation in the program (e.g., zooming) is also optimized for touchscreens and touchpads, so it won’t matter whether you use a PC or a laptop. 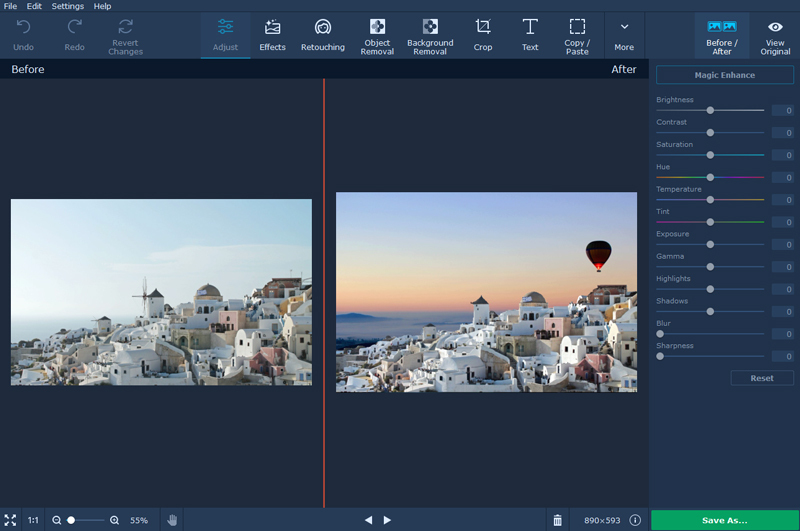 Try it now and see it for yourself: this photo editor is ready for any of your experiments with pictures!